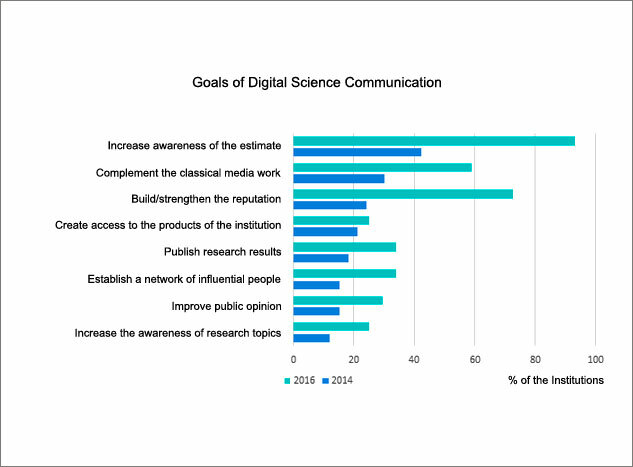 Digital science communication has become established at the institutes of the Leibniz Association and is assuming increasing strategic importance. The instruments involved are diverse, including social media. The results of a 2016 study and the comparison with 2014. The Leibniz Research Alliance Science 2.0 conducted a study (only in German language) on “Social Media within the Leibniz Association” back in 2014 showing that social media have definitely become established at the respective institutions of the Leibniz Association (link in German) and are being used for external representation in particular. The study (only in German language) was repeated in 2016 in order to compare the status quo with 2014 as well as focus more broadly on digital science communication in general and not just on social media. That is why the 2016 study should be considered as a supplementary study to 2014 and not simply as a repeat study. 88 Leibniz institutions were consulted, 59 of them participated in the survey; 44 completed the questionnaire. Generally speaking, digital science communication has become established at all Leibniz institutions, having become an important communication tool for external representation in order to reach, for example, the specialist community as well as journalists and the media. It has been shown that the more “conventional” means of communication such as online press releases (84%) and websites (70%) as well as e-mailings (59%) are very important. Social media, especially Twitter (61%) and Facebook (59%), also play a very important role. Interestingly, many institutions use Wikipedia (63%). A wide range of instruments are generally used. “Which of the following tools and measures for digital science communication are used at your institute?” (absolute: n = 272, multiple answers possible). 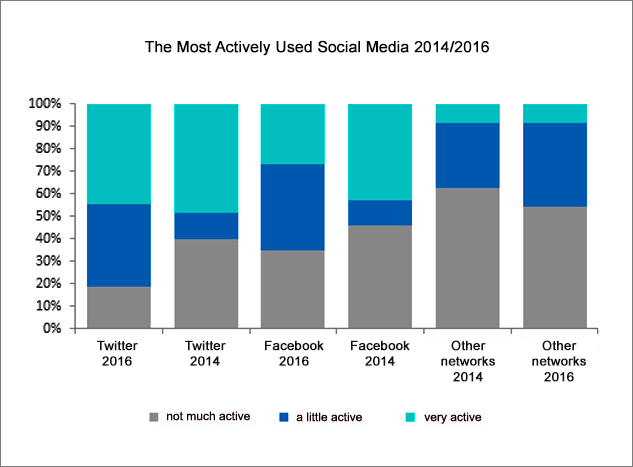 Based on usage intensity and compared to 2014, there is a shift to conventional social networks such as Facebook and, in particular, Twitter. Other “online portals” such as YouTube, Flickr or Wikipedia are used a little less often. Scientific social networks such as Mendeley, ResearchGate or Academia.edu continue to play at most a minor role. “How strongly does your institute use the tools and measures for digital science communication that you mentioned?” (aggregated to three items, 2014, n = 35; 2016, n = 27). 90% of institutions surveyed believe that the internet and social media have grown in importance in the context of digital science communication over the last 5 years. For 75%, it has also become more important that insights into open science research are made possible for all scientifically interested users. 82% of institutions surveyed also see a long-term structural change in the digitisation of science and 77% say that their activities in the field of digital science communication and social media are likely to increase over the next 1 to 3 years. 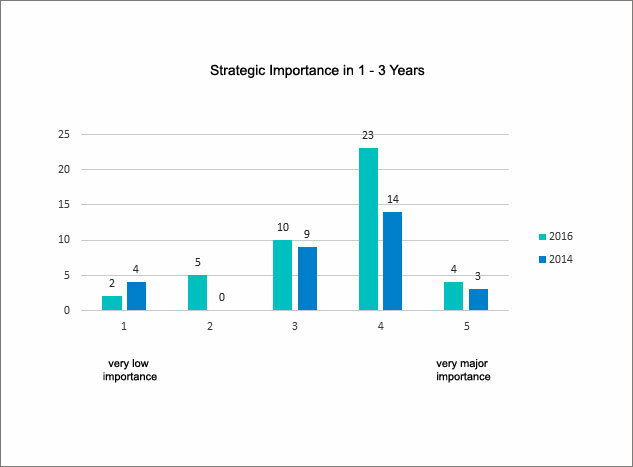 “In your opinion, what is the strategic importance of digital science communication at the institutional level for your institution in the next three years?” (on a scale from “1: very low importance” to “5: very major importance”, n 2016=44, n 2014 = 30). Compared to 2014, it is very clear that digital communication is playing an increasingly important role in raising awareness (93%), supplementing conventional media work (59%), and developing and strengthening the reputation (72%). “What are the five most important goals that your institute is pursuing with digital communication?” (absolute n 2016 = 200, n 2014 = 68; institutes 2016: 44, institutes 2014: 33; multiple answers allowed, but a maximum of five). On the one hand, it is clear that digital science communication is highly relevant, while its strategic importance is steadily growing. On the other hand, it is important to check as to whether and in which way the relevant measures are effective. 54% of the surveyed institutions stated that they were able to measure the resonance (for example, what content of a newsletter was read by how many people, recording the number of comments / shares / likes / retweets, etc., or the visits/downloads of online content ), and another 25% plan to do so. 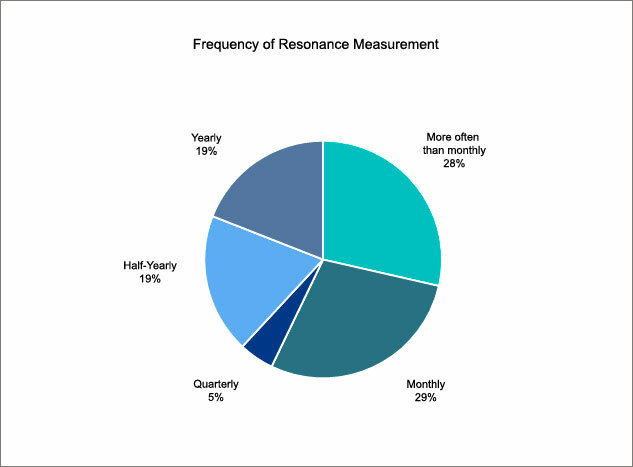 57% take relevant measurements at least once a month. 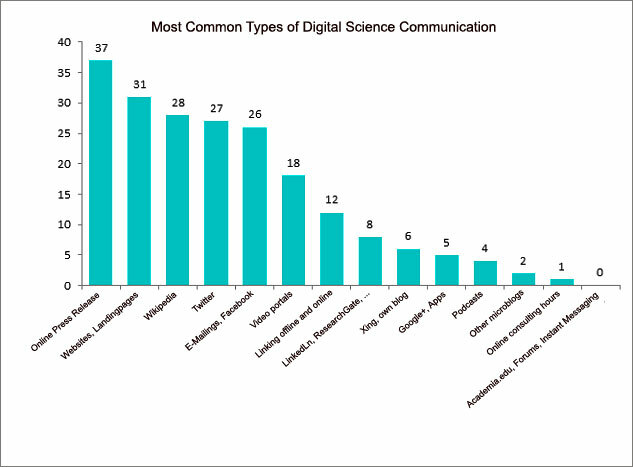 “Do you measure the resonance of your institute’s digital science communication activities?” (N = 24) ). The increasing relevance of digital science communication also raises the question as to the extent to which relevant measures should also be used in evaluating research institutes. Social media based indicators, such as altmetrics, are increasingly being discussed at the scientific-political level in the context of scientific evaluation. 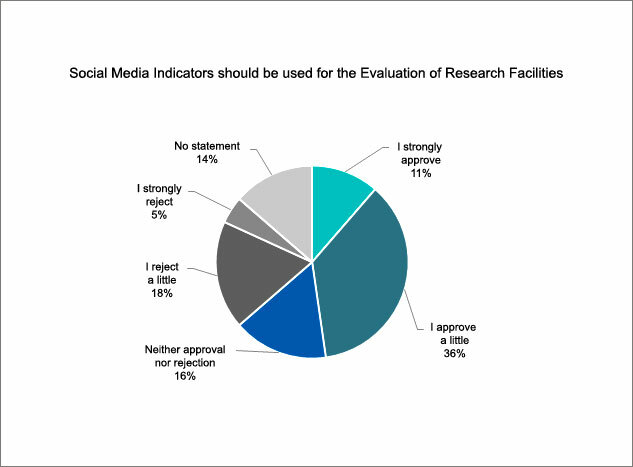 47% of the institutions surveyed are at least positive about the use of social media for evaluating research institutions, a slight increase compared to 43% in 2014. Negative attitudes have also decreased compared to 2014. There is a nevertheless a general attitude of reservation and scepticism towards social media and digital science communication in the institutions, either because the costs are seen as being too high and there is a general rejection on the management level or among employees, or because their scientific nature is generally put in question. “What do you think of the following statement? Indicators for the presentation of digital scientific communication should be used to evaluate the visibility/networking of research facilities” (N = 44). 2014 study (PDF in German). 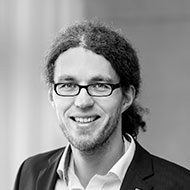 Wie könnte eine Science 2.0-Strategie für Bibliotheken aussehen?